​When used as a verb, to rogue means to get rid of items that don’t conform to a certain standard. In plant pathology, the word rogue is used to describe a technique whereby diseased plants are removed or rogued to slow the spread of disease. I’d like to describe the practice as it might be used to manage Phytophthora blight of pumpkins. The practice works like this: Under conducive conditions, Phytophthora blight spreads quickly from leaf to leaf and from plant to plant. From a single diseased pumpkin plant, an entire field can become infected. But what if one could rogue the few symptomatic plants at an early stage in the disease epidemic? Would this slow the spread of Phytophthora blight? In theory, yes. If one were able to rogue all of the diseased plants in a field, the disease could be slowed. It would be similar to sending sick children home from a classroom; the disease should progress at a slower rate with sick children removed than if they had stayed and infected more children. However, in practice there are a few complicating factors. Read below for more details. Pumpkin plants may become infected with the organism that causes Phytophthora blight either by coming into direct contact with soil which harbors the causal organism or from spores that are spread from diseased plants. The practice of roguing is designed to slow secondary or plant to plant spread of the disease. Phytophthora blight that is caused by direct contact with the soil will remain unaffected by roguing. Therefore, roguing diseased plants will not stop new infections from soil borne fungi, however, this practice should slow the secondary or plant to plant-spread of Phytophthora blight. Another complicating factor—it is almost impossible to completely eliminate all diseased plants. The reason is that pumpkin plants with Phytophthora blight do not show symptoms immediately. There is a period of 3 to 5 days between when the pumpkin plant is infected to when symptoms become visible (in plant pathology, this is known as the latent period). So, if one were to rogue all symptomatic plants, almost certainly some of the adjacent plants are infected but not showing symptoms yet. The best solution to this problem is to rogue some of the healthy plants along with the diseased ones. Or, as they taught us in graduate school, rogue till it hurts. If one must remove apparently healthy as well as diseased plants when roguing, how many healthy plants must be rogued? Unfortunately, there is no mathematical formula for estimating how many healthy plants to rogue. However, let’s assume that a rain storm accompanied by strong winds can blow splashed spores 10 to 15 feet. If most pumpkin plants are on 6 foot centers, then one should remove about two rows of apparently healthy plants in addition to the diseased plants. Each grower will have to estimate the amount of healthy plants to rogue based in his or her own circumstances. Roguing for disease management is most likely to be successful if attempted early in the disease epidemic. 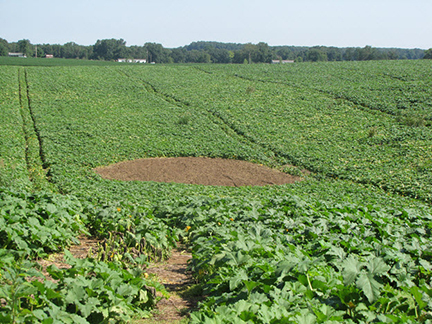 Let’s imagine that a few pumpkin plants are observed with Phytophthora blight in a low area of the field. The decision to rogue is made. The diseased plants are cultivated under as well as 2 or 3 rows of healthy plants beyond the plants with symptoms. The cultivation equipment is cleaned off to prevent soil from the diseased field from being carried to a different field. Such a situation is shown below in Figure 1. While success is not guaranteed, roguing has the potential to slow disease spread. A situation where roguing is less likely to be successful is one where much secondary spread has already taken place. If a relatively large area of the pumpkin field already has symptoms of Phytophthora blight, the disease may have spread beyond where roguing may slow disease spread. If the field has a long history of Phytophthora blight over most of the field, roguing may not help. In deciding whether to conduct a roguing operation to manage Phytophthora blight of pumpkin, it may help to know whether secondary spread of this disease has occurred. Initial or primary spread of Phytophthora blight usually occurs in low areas of the field. Since initial outbreaks of Phytophthora blight are likely to come from fungi that have survived in the soil, the first plants to be affected often have lesions where the plant has the most contact with the soil, at the very base of the plant where the main stem meets the soil. (Mature fruit which comes into contact with the soil may also have symptoms of Phytophthora blight. By the time mature fruit are present and symptomatic, however, secondary spread is likely to have occurred.) Secondary spread, that is, disease that has occurred as a result of the splash of spores from a plant initially infected to the leaves and stem of healthy plants often occurs on the leaves, petioles or branches of the pumpkin plant. There are other circumstances where roguing may be used as a disease management tool. Each circumstance, however, must be considered on its own merits. Please let me know if you have any thoughts or questions. This article was originally published on the veggiediseaseblog.org on August 30, 2015.